Beef, water, worcestershire sauce, soy sauce, teriyaki sauce, crab boil powder, garlic powder, liquid smoke, onion powder, crab boil liquid, hot sauce. The first thing I taste from the surface of these pieces is a salty seasoning blend weighted towards garlic, onion and a faint bit of spiciness. The chewing brings in the same seasoning with a bit more definition and an increased spiciness. The seasoning becomes more complex taking on a very savory quality with touches of citrus and other spices that's difficult to ascertain. For being marketed as "Melange Original", in which the word melange refers to a mixture of different things, it's seems to hold up well. It has a complex blend of seasonings, which aside from garlic, onion, salt, and some kind of chile pepper, is difficult to pick out all the subtleties that go into this. 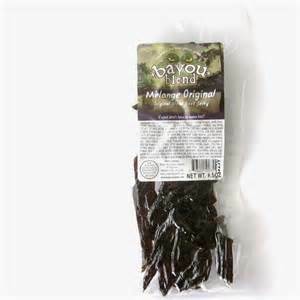 But if you think about words like "bayou", "cajun", and "Louisiana", the flavor seems quite representative. I think of a pot of seafood gumbo with some hot sauce and a ton of spices thrown in. 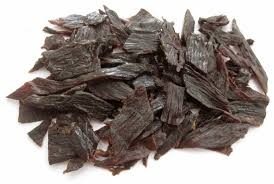 Otherwise, the flavors that seems to define this jerky the most is the complex seasoning blend. It starts with a salty, garlic and onion combo, but brings in a little bit of hot sauce, maybe touches of lemon citrus, and who knows what else. The natural meat flavors are not well noticed in this, but there's also light amount of sweet and hints of the soy sauce towards the latter part of chewing. As for the spiciness, there is indeed some heat to this. I'd rank this as "medium" on my personal heat scale (level 3 out of 5), even though the package states, "Cajun doesn't have to mean hot!!" 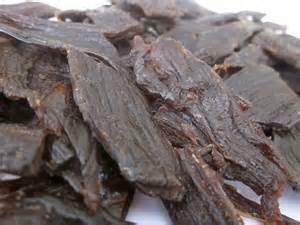 Overall, the ingredients combine really well to create a jerky flavor with a bold, spicy seasoning flavor that seems to mimic something you'd expect to get from cajun-style cooking. This Melange Original beef jerky from Bayou Blend has a very bold, complex seasoning flavor that grabbed my attention right away. It adds in a noticeable hot sauce component giving this jerky a bit of the vinegar/chile pepper dimension, but also a wee touch of lemon citrus in the background. The end result is a flavor that seems to reflect the taste of cajun-style cuisine. But I wasn't able to get enough of the natural meat flavors in this which essentially reduces this jerky down to its marinade flavor, which is actually pretty good, but not quite enough to break into the top layer of "best".